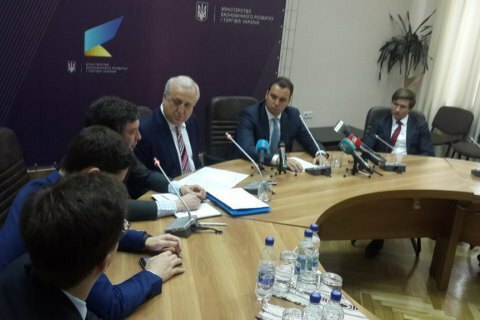 Economic Development and Trade Minister Aivaras Abromavičius introduced the new members of the supervisory board. The Economic Development and Trade Ministry has selected three foreign nationals to join the supervisory board of the state-owned oil and gas company Naftohaz Ukrayiny. Minister Aivaras Abromavičius announced their names at a briefing on 25 March. These are Marcus Richards, Charles Proctor and Paul Warwick. Marcus Richards has over 33 years of experience in oil and gas, including senior posts at British Petroleum and Dana Petroleum. Currently he provides consulting services to a number of companies and investment funds and gives lectures at Aberdeen Business School. Graduated from Harvard Business School and received his PhD from the University of Wales. Paul Warwick has over 32 years of experience in oil and gas, including senior posts at ConocoPhillips and Talisman Energy. Worked in Norway, Great Britain, Poland, Indonesia, North and West Africa, and the Middle East. Received his Master's Degree from the Cranfield Institute of Technology, studied at London Business School. Charles Proctor has over 27 years of experience in oil and gas, including senior posts at Вritish Рetroleum and Genel Energy, worked in Azerbaijan, Angola, and the Middle East. Holds Master's Degree from the Downing College. In 2015, the Ukrainian government started reforming the corporate management of Naftohaz Ukrayiny to bring it in line with the principles of the Organization for Economic Cooperation and Development. One of the key tasks of the reform is to make the company free from political influence. The supervisory board will have unprecedentedly broad power and responsibility to supervise the company’s board. In particular, the supervisory board will form committees on audit, ethics and on appointments and remuneration. The supervisory board will also deal with compliance, risk management and corruption prevention. On 19 January, the Economic Development Ministry started selecting candidates for Naftohaz's supervisory board with the help of the international recruiting agency Odgers Berndtson financed by the European Bank for Reconstruction and Development. The board will have five members, three of whom will be independent and two will be appointed by the government. One of the independent directors will be appointed as chairman of the supervisory board.